According to Mike Tickle, Senior VP of Sales, "As cloud technology grows, Philosys is working to create an App-to-Cloud secure connection in the next generation of updates." 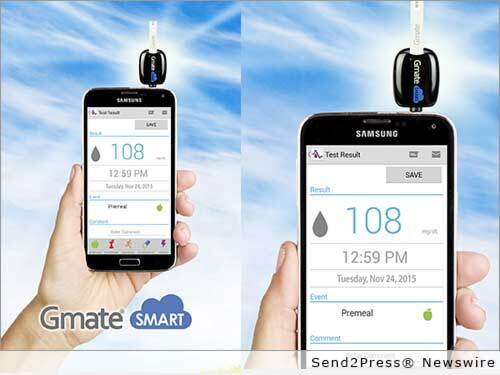 NEW YORK, N.Y., Dec. 2, 2015 (SEND2PRESS NEWSWIRE) — Philosys, the maker of Gmate® products, announced today that the U.S. Food and Drug Administration (FDA) has approved clearance for the Gmate SMART Blood Glucose Monitoring System and App for Android™. The Gmate SMART is a small, portable blood glucose meter that plugs into the headphone jack of a smartphone and provides fast and accurate blood glucose test results. Together, the Gmate SMART Meter and App turn your smartphone into a mobile blood glucose monitoring system. The FDA approval of Gmate SMART for Android is another important milestone for Philosys. The Gmate SMART App is now available for both iOS and Android users. This is the next critical step for Gmate mHealth technology. The Gmate SMART Meter is the size of a quarter and connects to the headphone jack of the smartphone. The Gmate SMART App integrates diabetes management directly to the iOS and Android device, providing better diabetes management including goal setting, graphing and the ability to email or text your blood glucose test results directly to a family member or your healthcare provider. The Gmate SMART App stores an unlimited number of test results electronically with the date and time. A user can also add custom comments, actions or notes to each test result. The Gmate SMART is a faster, smarter way to manage and improve diabetes care. The Gmate SMART App is a free download on the App Store™ and Google Play™. Philosys is a manufacturing company that specializes in medical, diagnostics and analytical instruments. The range of services we provide covers the entire product cycle from concept through to manufacture. Philosys’ philosophy is to develop cost-effective design and manufacturing solutions that satisfy our customer’s vision. For more information and where to buy, visit http://www.gmate.com/. News issued by: Philosys Inc. Original Keywords: Philosys Inc. New York New York NEW YORK, N.Y.
RSS News Feed for Philosys Inc.
REFERENCES: Drugs and Pharmaceuticals News, Philosys Inc. New York New York NEW YORK, N.Y.